I'm all about a neighborhood spot that offers both a feel-good, casual atmosphere as well as fresh and delicious food. 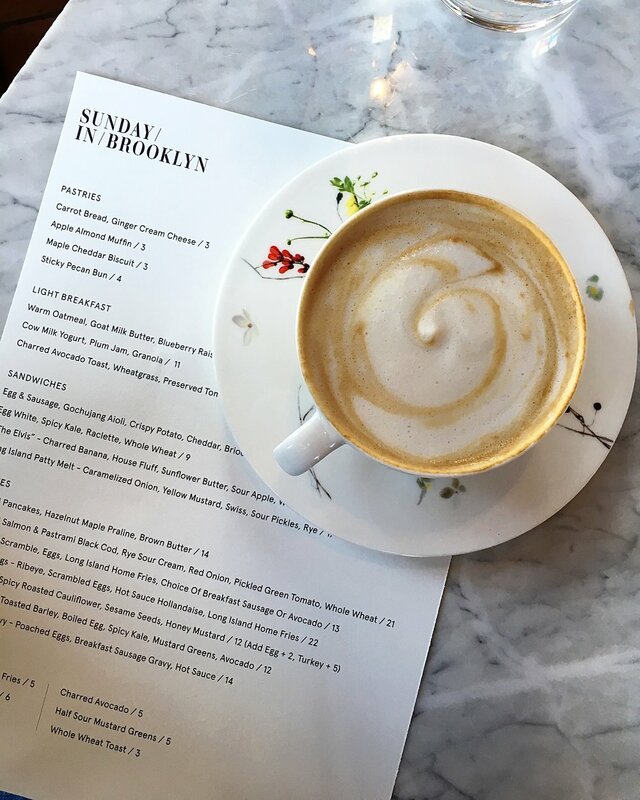 Sunday in Brooklyn strives to do just that with a welcoming restaurant, market and coffee counter in South Williamsburg. The owners have taken their favorite day- Sunday!- a day of comfort, adventures, and family, and made it the mission of the restaurant. I was a big fan of Isa, the previous restaurant in this location, so SIB had big shoes to fill in my book. My husband and I stopped in for brunch recently, and are already looking forward to a return trip soon. We started with cappuccinos and a warm, freshly baked pecan sticky bun, which pulled apart in perfect ooey, gooey layers. Since it was Sunday, after all, we indulged in a bloody Mary and spiked hot cider, which were perfectly spicy and sweet. It was hard to decide on entrées as we were tempted by several dishes- the malted pancakes, biscuits & gravy, plus a variety of sweet and savory sandwiches all sounded delicious. We decided on the grain bowl and patty melt, which did not disappoint. And how pretty are the marbled ceramic plates!? Scroll through the photos to see more descriptions of each item. Even better, at SIB it's Sunday every day, so brunch is served seven days a week! Pop into the cute market shop for some ready-made pastries and pantry items, or grab a coffee to-go. 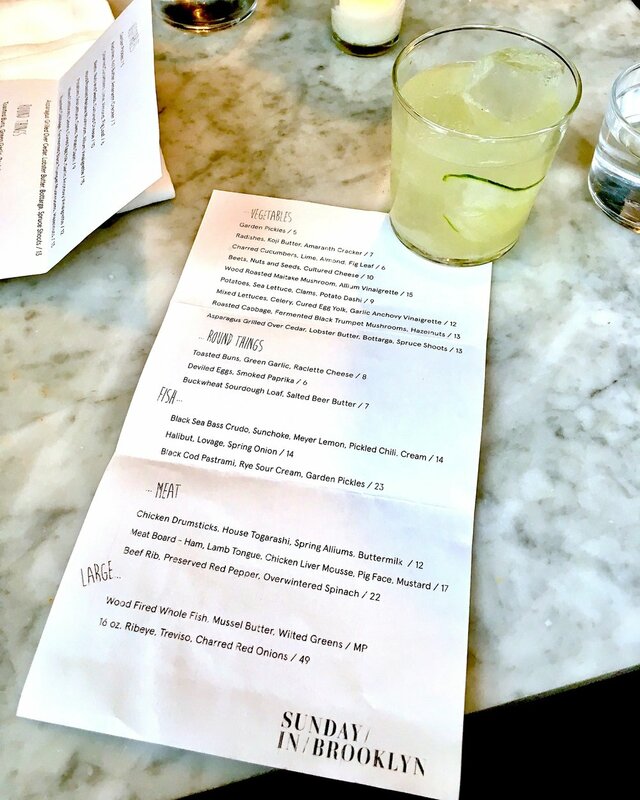 I've also had the opportunity to enjoy dinner at Sunday in Brooklyn, and the meal was fantastic (see below!). I love that they've utilized the upstairs dining area- a space that Isa reserved for private events- because it has such a lush and cozy feel to it that makes it seem like home. Plus the rooftop garden and sidewalk café are open in the warmer months, which is clutch for any NYC restaurant! 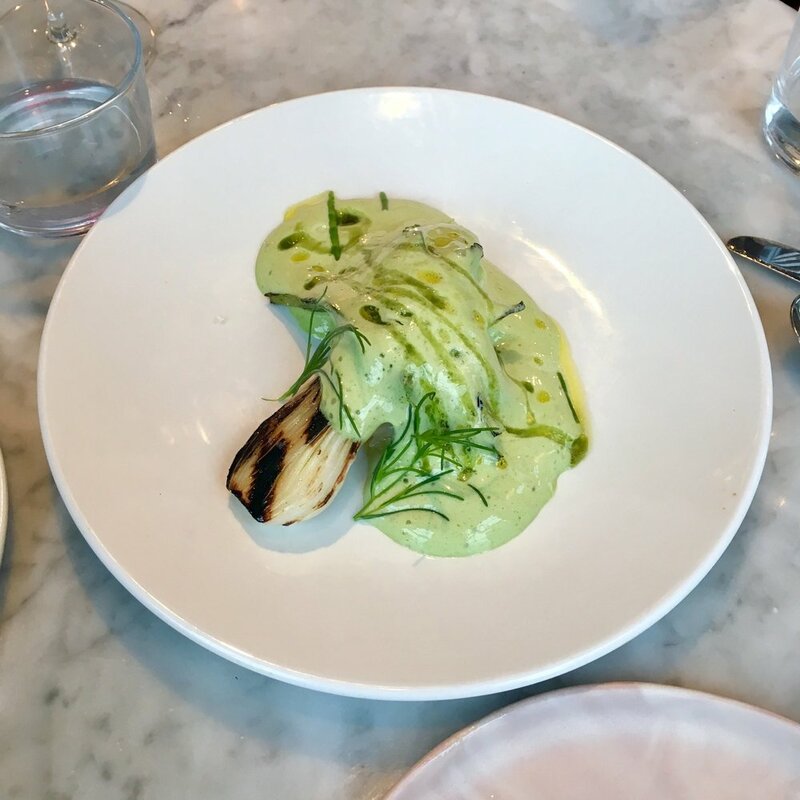 The spring menu was so fresh, vibrant, and über colorful- the chef knows how to put the season's bounty to good use in the tastiest ways imaginable. 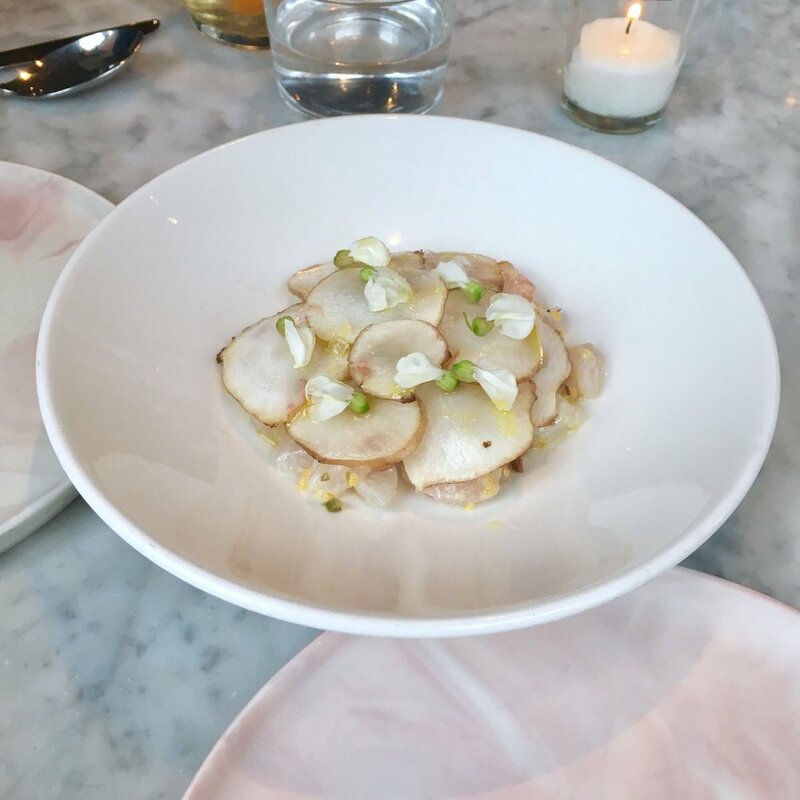 Some dishes, like the radishes with koji butter and the beets with nuts & seeds, were truly works of art and just begging to have their photo taken (I was more than happy to oblige, of course). The roasted cabbage with fermented black trumpet mushrooms had such a unique and interesting flavor profile that kept us coming back for more. I'm not even a fried chicken person (I know- who am I? 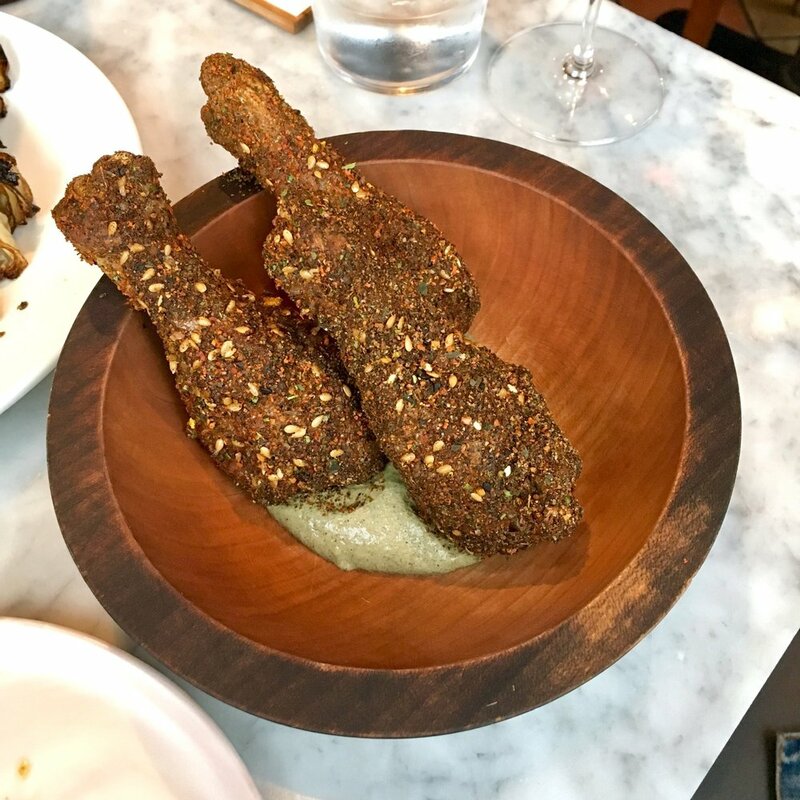 ), but the housemade togarashi blend coating the drumsticks really took these babies to the next level- totally addicting! If you can believe it, I didn't get a good photo of our desserts. I'm actually surprised this doesn't happen more often considering how little discipline I have around sweets. But I can assure you that both the goat ice cream with date molasses & bitter chocolate AND the warm devil's food cake with peanut butter ice cream & cocoa nib praline are to die for! I'm already looking forward to returning soon for an afternoon cocktail in the rooftop garden!